Ritual Room: Single: Screaming Trees - "Something About Today"
Single: Screaming Trees - "Something About Today"
Here's the Screaming Trees "Something About Today" single which includes 2 previously unreleased tracks (both of which also have the theme of days, imagine that). This was released in their major label/Uncle Anesthesia days and yadda yadda yadda... really, what else can be said that hasn't been said already? 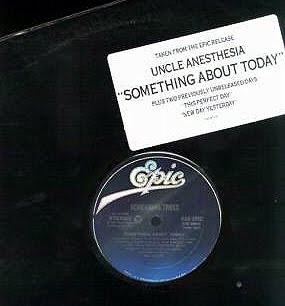 DL: "Something About Today Single"
Track 3 is a Jethro Tull cover! Track 2 is a Saints cover! Track 1 is not a cover! Album: Absum - "Purgatoire 2007 - 2009"
Single: Big Chief - "Strange Notes"